The premier journal providing evidence-based information for understanding the complexities and benefits of breastfeeding for mother and infant. This indispensable resource covers a wide range of lactation medicine topics including epidemiologic and physiologic benefits, breastfeeding protocols, and the health risks of artificial feeding. 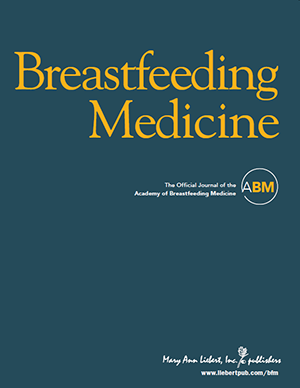 The Official Journal of the Academy of Breastfeeding Medicine. Includes biweekly companion e-newsletter Briefings in Breastfeeding Medicine. This and more in Breastfeeding Medicine. The Academy of Breastfeeding Medicine Issues Guidance on Informal Milk Sharing for Healthy Term infants. Click here to view and share with your colleagues.